Looks like Valve realized their mistake of leaving the achievement console commands in the game. They released another patch today to eliminate the command and I would assume anyone who used it will have their achievements reset in due time. Would also like to thank the readers of Planet HalfLife for visiting today. I couldn’t figure out why our traffic was so high today! They linked us on their front page. 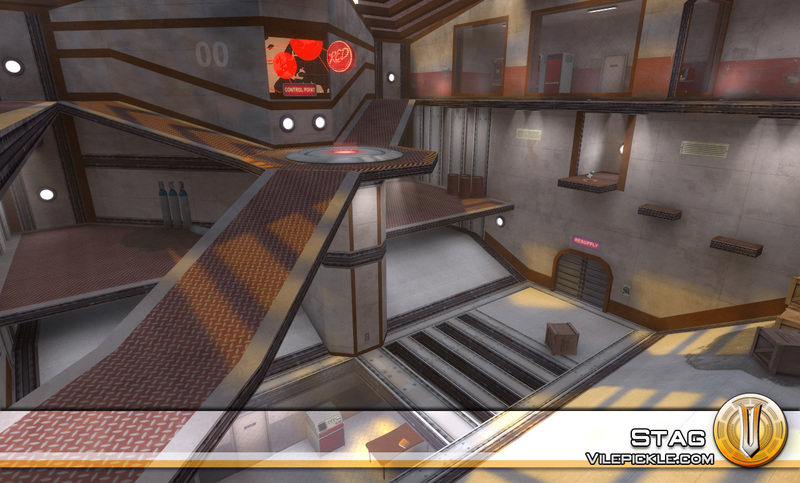 Our good friend in REV6 and community architect, Vilepickle, has released his final version of CP_Stag. 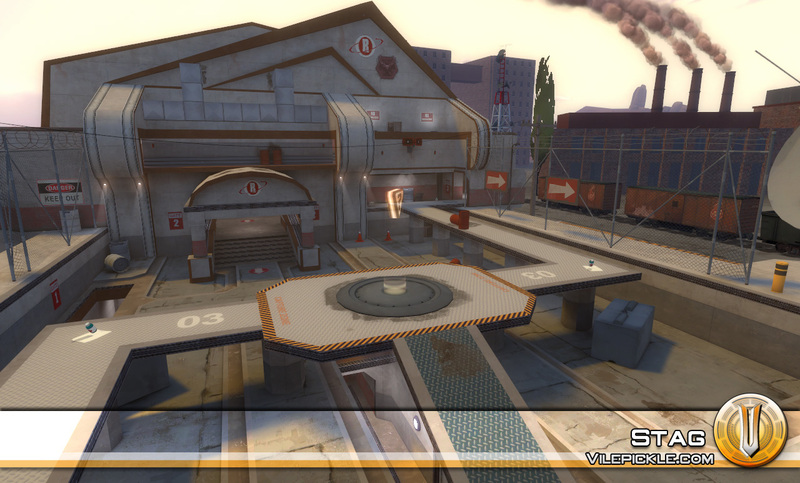 This map was a favorite of Q3F players everywhere and I’m glad to see it ported and updated for Team Fortress 2. A blogger over at Bad Gamers had the following to say. 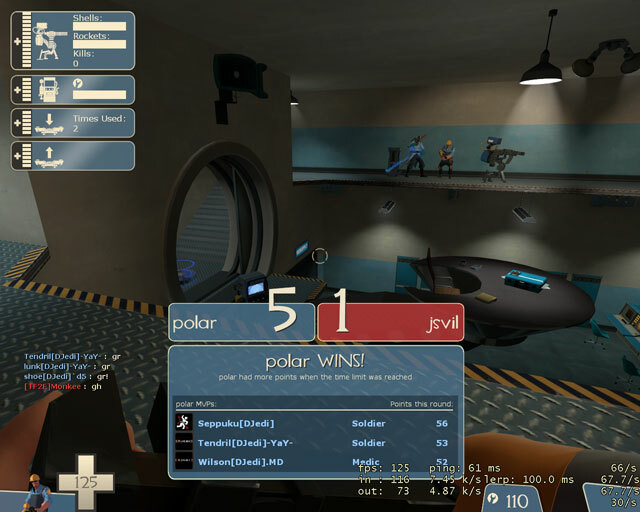 Vilepickle’s cp_stag reached final as expected and the minor fixes to the already quite polished b4 were wider corridors in the mid section in order to keep the demomen even more busy with their sticky bombs. If you don’t already have all his maps then go grab the Pickle Jar pack of 6 map delicacies! Last night we faced off against |RES| on cp_desertfortress for STA. As lunk mentioned in his post last night, Valve released the long awaited Medic Achievements and Goldrush update last night at about 9:00 p.m. EST (30 minutes before the match), so both teams were eager to get to work on earning the achievements and unlocking the new medic weapons. Let me say that the Vampire Gun is totally awesome and I think its great that Valve is adding functionality to the game for free to keep it fresh and I can’t wait to see what they roll out for the other classes. After waiting over a half hour past the scheduled match time for RES to get their 8th member online, DJedi had to ask to start the round as we had a number of players who had to work the night shift and could only play the first round if we started immediately. This was disappointing as RES is always an excellent oppononent and we were looking forward to a great match and prefer not to have an unfair advantage. DJedi took the first two caps easily with |RES| down a man, before their 8th arrived. With an even lineup, things got more interesting as both teams traded frags and the battle see-sawed back and forth between A and B, with both teams struggling to capture both and push to the final control point. The sniper bullets of Polar[DJedi] and |RES|cides whizzed through the air as Wilson[DJedi] and |RES|Phaser traded rockets on the roofs and heineken[DJedi] and Tendril[DJedi] kept |RES| on the defensive with their ninja scouting. After a hard fought battle, moop[DJedi] and theSpawn[DJedi] pushed the final CP, with piping support from shoe[DJedi] to end the round in a shutout. Round 2 saw theSpawn and heineken having to go off to work with gholam and Akira coming in. The first cap went to |RES| as they managed to divide and defeat the [DJedi] forces with a combination of speed and firepower thanks in part to a triple scout assault. [DJedi] rallied for the second clash, with lunk[DJedi] medicing and calling some key pushes. The teams seemed to swap control of the A and B CPs consistently before a coordinated attack on B finally resulted in [DJedi]’s control of both CPs. We pushed the final CP with an uber to tie the round up 1-1 and ensure a [DJedi] victory for the match. 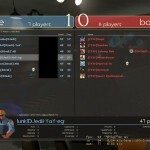 It was a great game when both teams fielded 8 players and cp_desertfortress proved a worthy battlefield. We look forward to playing |RES| again. 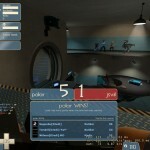 This week started out with a disappointing forfeit win from [CSI] in STA. 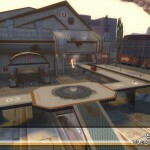 Coming from a qwtf background, we were looking forward to playing some ctf_smooth, as its a port from the very popular original QWTF version by DrSmooth[OSKI] and we all have some great memories of epic matches on smooth against clans like Megadeath, Gothic Terror and The Nothing. The new version plays great and is substantially brighter than the original. The only issues we’ve experienced are that you can get snagged in the water entrance and occasionally you will spawn with everything crooked (and I couldn’t find the quad damage). 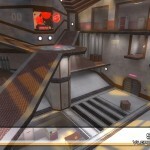 Luckily, Team Fortress 2 Fort was gracious enough to give us a map change to 2 rounds of ctf_smooth for our TFL match from ctf_impact (another great QWTF port of a map originally built by my former clanmate [WM]Kordos and created for TF2 by the talented Vilepickle, who just keeps making great custom maps). We had time to squeeze in some Jedi portraits next to lunk’s epic regret and cheetos spray before the round started and you can check out the moop portrait to the right. Round 1 started off with a bang as we pulled out an early capture thanks to some impressive spy work by resident hibernator Polar. As the round continued, the dual assault of our 2 medic soldier combos of Tendril + theSpawn and Moop + Wilson overwhelmed the enemy base and brought home 4 additional caps, while our defense locked down our base, letting only 1 cap out and racking up the teleporter points. 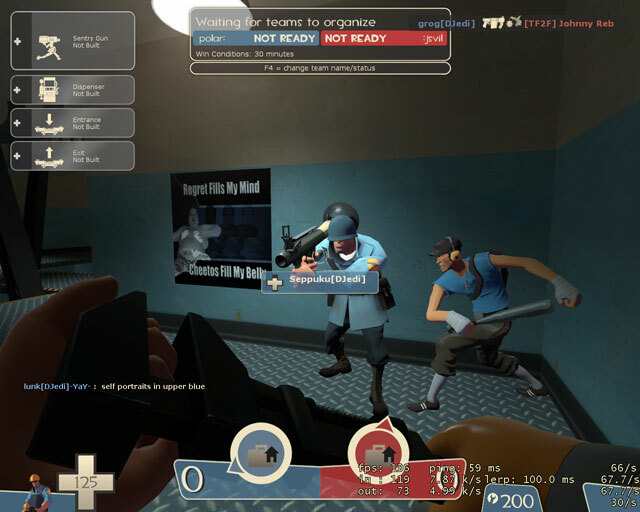 Round 2 started with another early cap from DJedi, after which TF2F’s defense dug in, with [TF2F]Thrickstr’s demo’ing and [TF2F]PanFrie’s medic hunting scouting keeping our offense at bay for the rest of the round. With DJedi dominating the middle of the map and continually pushing against the near-impregnable TF2F defense, they were unable to get any substantial flag movement. 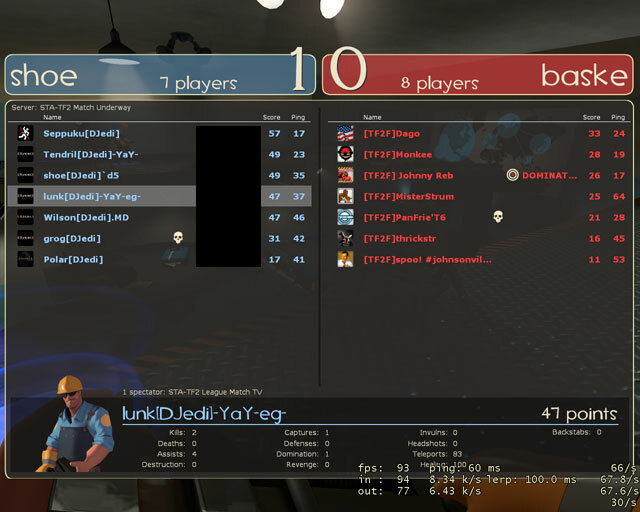 GG [TF2F], you were a worthy opponent as always. Thanks for the map change. 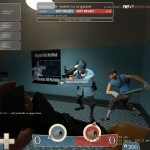 TF2 Karaoke: Hollaback Girl from FLOOR MASTER on Vimeo. Last night DJedi faced off against oooRGLE gaming for TFL. We were originally scheduled to play rock (death by gas chamber anyone? 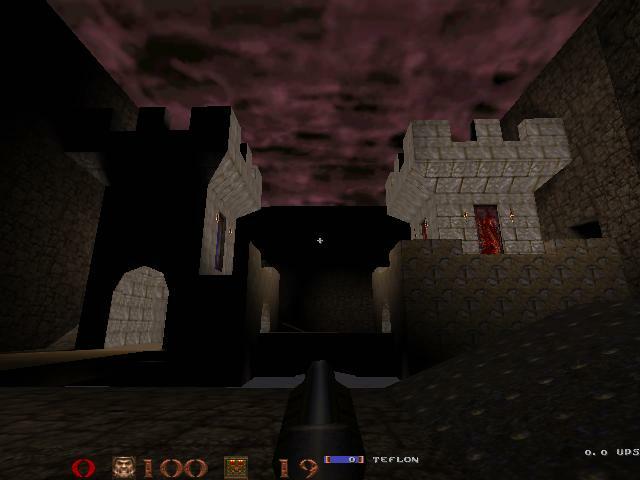 ), but agreed to switch maps to gravelpit. Round 1 started off with DJedi on offense and heineken pulling off a double backstab on oooRGLE’s demoman and sniper. DJedi moved into A for the capture, sending a squad to start the attack on B. Some clever spying from oooRGLE put us down a medic during our initial push, giving them the uber advantage. Despite a number of close calls, oooRGLE was able to stop DJedi from capping B. We switched sides, with DJedi on defense and managed to hold oooRGLE at B for a while before getting overwhelmed by their dual demoman assault and the formidable sniping talents of remics. Having the uber advantage, oooRGLE capped C swiftly after. Thanks in part to Slingshot’s sniping, DJedi’s round 2 defense went slightly better than round 1. However, down our starting demomen due to real life obligations, oooRGLE eventually managed to overwhelm our defenses and capture B, with C soon falling soon after. Our offense this round stepped it up to cap out all three CPs, ending the round with w a 6-4 win for oooRGLE. 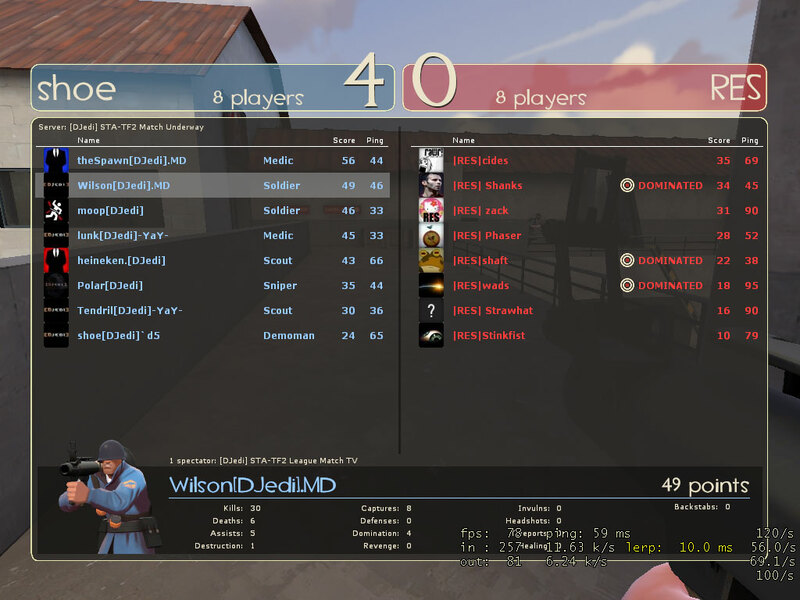 After the match, we had an excellent 10v10 pickup game on 32smooth, kicking things off by crashing every single person in the game’s TF2 as well as the server. After this initial glitch, we had an awesome game and I was surprised at how well the map held up with that many people, just goes to show that you don’t have to play TF2 6v6 or 8v8. 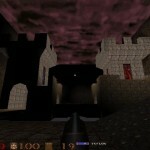 It was very reminiscent of the quakeworld team fortress games we all enjoyed over a decade ago. The game included aliases borrowed from some old school qwtf personalities such as SPEEDinator (creator of the original speedstats), PHAT DRAGON and Cryojenix. 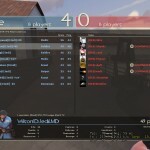 Shoutouts to the following qwtf clans that have made it to TF2 and had members playing last night: NULL, Rev6 and Aftermath. 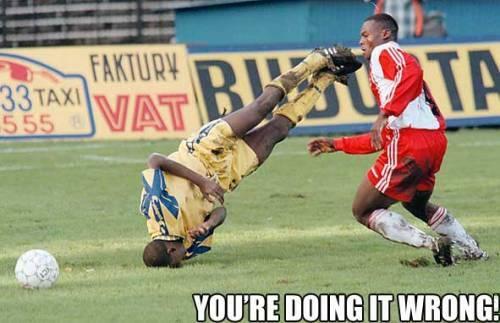 Thanks for coming out, we should make this a regular occurance. Today is the day of the spy! I wanted to post this as soon as I saw it, but with both of the spy videos being of such high quality I had to post them both on the same day. Hope you Enjoy. Tina Turner sets the tone with her song Goldeneye in this video. Very well done, I like the editing work and the inclusion of custom maps.